anticipation of writing a post or story? Anyone could logically say there is a blank space or page. And while this is true, there are many of us who tend to imagine the onset of disaster if a mistake is made. Maybe you type a letter or word that just doesn’t seem right. Maybe you end up writing a whole sentence that doesn’t fit. It’s called an error. You can fix this. Writing a grammatically incorrect sentence is far different from hitting someone in the nose. Revising what you typed is a temporary setback or even a way to learn more about writing. It is not a crime. An error in typing is not going to bring on imminent danger. I can tell you this all day long, but a lot of us will still think, feel and imagine an imaginary sniper ready to shoot us upon the first stroke of the key. Why else would you sit there and think about what to say? What is with the hesitation? Writing is simple. I’m not saying talent comes easy. But the task of putting words on paper or the screen is an elementary function which most of us have. Using your fingers to make words is something that human beings can do in any state of mind. The ability to create a fluid, coherent message with words will only come with practice. But the fingertips have to touch the keys. To understand my claim about the imaginary sniper, try writing a story on a general subject as soon as the blank page appears. Or get a notebook out and apply the pen or pencil immediately. Don’t stop for corrections. Just continue writing. Pay attention to how your body reacts. 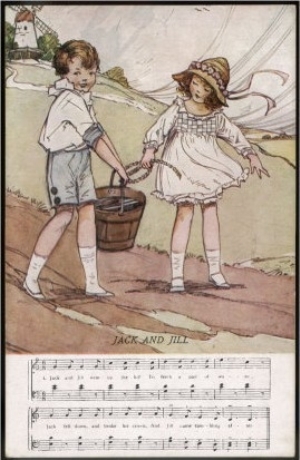 Jack and Jill go up the hill to fetch a pail of water. Jack falls down and breaks his crown. Jill skips along to the other side of the hill and continues to take the pale to where it belongs. She does think about Jack and hopes he will dust off and catch up with her. Her wondering is interrupted by a colorful tune from the cellphone and she is soon on the way to drop off the bucket and head over to Sally’s house for lunch. Maybe they would go out later. Jack kicks around rocks for a while and by mistake attracts a cloud of angry bees. Oops! Apparently, in the middle of all his huffing, puffing and wild throwing he sent a rock flying into a hive. Ten minutes and one hundred bees later, he’s lying on the ground and moaning. The stings produce ugly bubbles with a red prickly center in each all over his face. Jill is sitting at Sally’s house on the porch laughing it up over the stories of their other friends antics. Jack’s name comes up as well. Both of the girls plan a late night and drink their tea. Doug pulls into the driveway in his hopped up four-wheel-drive work truck and jumps on to the porch; soon adding to the laughter about goofy friends. Meanwhile Jack is running from a two-hundred-pound wolf. He smacks himself hard against a tree, but manages to get a grip on the lowest limb and climb up to safety. Laying in the upper part of the tree, he starts to wonder where Jill went to. She told him earlier about the possibility that Sally might call. He thinks about punching her in the shoulder later for leaving the hill. His face is burning. Both of them had the task of taking the water to dear old Miss June’s house. She’s been sick lately and paid them the day before to fetch water. Jack sees that the wolf stops waiting and trots off back into the woods. Jack has to take the chance of getting out of there on his own. He forgot to charge his phone last night. Hell of a moment. But he has to get out of the tree. Jill, Sally and Doug aren’t there with him. It’s either lay around and moan on the big branch or climb back down and run. Then Jack will be able to help make his group of friends into a foursome during a night on the town.